On Tuesday, less than two months after Kinder Morgan suspended its controversial Trans Mountain pipeline project, the Canadian government announced a plan to purchase the project and terminal assets for $4.5 billion from the American company, unleashing a storm of criticism over the move. Photo courtesy of Zack Embree/SumOfUs Just days prior to the announcement, a new study found that further expansion of Canada’s tar sands mines would contribute to carbon lock-in and long-term oversupply of oil, slowing the world’s transition to a low-carbon future. “Today’s agreement will help advance Canada as an energy leader, as a place where good projects get built,” Canada’s Natural Resources Minister Jim Carr said while making the announcement that the government would pay Kinder Morgan for what it has already spent on the expansion project as well as for the existing Trans Mountain pipeline. “This is yet another step in building an energy future with Canadians where the environment and economy go hand-in-hand,” Carr said. The agreement, according to the Department of Finance Canada, means that construction of the pipeline will resume this summer. And judging by reaction to the announcement, protesters will be ready to fight it. The existing Kinder Morgan line, which was built in 1953, can currently carry about 300,000 barrels of crude per day. The expansion project would increase the pipeline’s capacity by nearly 600,000 barrels of oil per day. The expanded pipeline, which would transport oil from the tar sands mines of Alberta to an export terminal on the coast of British Columbia in the city of Burnaby near Vancouver, would result in a massive expansion of the ecologically destructive oil mining process. On April 8, Texas-based Kinder Morgan Inc. had suspended work on the project, saying that it had become too risky a venture for the company following intense pressure from grassroots activists in addition to court challenges by the British Columbia government and First Nations along the pipeline route. The company has now agreed to work with the Canadian government to find a third party buyer for the entire Trans Mountain system by July 22. Trudeau’s government has declared the pipeline is in the “national interest,” and essential to the economic wellbeing of a country apparently desperate to get its vast oil reserves to international markets where it can command a much higher price for crude oil than the current domestic rate. A gap that, it says, represents billions of dollars in lost revenue. By Tuesday evening, those might have been the only positive words spoken about the agreement, as harsh criticism erupted from all sides following the announcement, including from a coalition of more than 800 businesses that questioned the move to make a major investment in an industry on the decline as opposed to clean energy such as solar and wind. Indigenous leaders in Canada, who have been leading the fight against the pipeline since it was first proposed in 2013, too, were vocal in their dismay at the announcement. The deal flies in the face of two commitments made by Prime Minister Justin Trudeau. Namely, upholding Indigenous Rights as outlined in the United Nations Declaration on the Rights of Indigenous Peoples (UNDRIP), and lowering Canada’s GHG emissions as declared in the Paris Climate Agreement. With one signature, Trudeau appears to have decided that fossil fuel expansion trumps the rights of Indigenous peoples to have final say on their own territories and that Canada will contribute to making climate change worse rather than better. 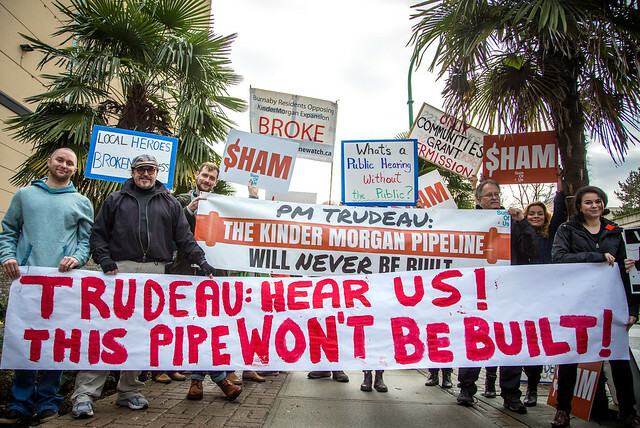 Thousands gathered in downtown Vancouver on Tuesday to protest the deal. Simon had his own conflict with the federal government during the Oka crisis in 1990 when the Mohawk people had a long stand-off with Quebec’s provincial police force the SQ, which began with a fight over the location of a golf course. It was the first well-documented conflict between First Nations and the Canadian government and one person was killed. As a result, he understands how precarious a situation is developing in British Columbia. On May 24, just days prior to the Trans Mountain announcement, a new study by the Stockholm Environment Institute (SEI) was released that paints a rather dire picture regarding Canada’s contribution to global emissions if oil production from the Alberta tar sands is allowed to expand with pipelines such as Trans Mountain as well as Keystone XL. “If Canada lets oil production expand as expected, global emissions could increase by 50 to 150 million tons of CO2 by 2030 — the equivalent of putting as many as 32 million cars on the road each year,” the report states. The study also found that further expansion of Canada’s tar sands would contribute to carbon lock-in and long-term oversupply of oil, slowing the world’s transition to a low-carbon future. “The Canadian federal government can significantly increase its ambition and contribution to global climate goals by limiting the future expansion of oil sands extraction,” says SEI senior scientist Peter Erickson. “Justin Trudeau still hasn’t learned two simple lessons; you can’t be a climate leader and build massive fossil fuel projects and you can’t ignore Indigenous rights and preach reconciliation,” says Clayton Thomas-Mueller, 350.org’s Stop-it-at-the-Source campaigner. “Despite tens of thousands of people opposing it, he just used taxpayer money to bailout a project that communities don’t want, that would break his own climate commitments and that Indigenous Peoples are fighting from the frontlines to the court-rooms.